Hednesford Town deservedly claimed all three points at Keys Park with a dominant display to keep pace with North Ferriby at the summit of the Evo-Stik Northern Premier Division, but The Pitmen were given a huge lift with the gift of a comedy opening goal for Neil Harvey in the first half. 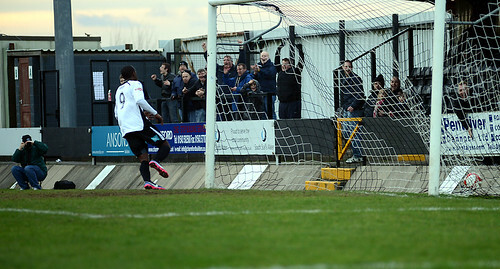 In a mistake usually only seen in slapstick gaffe compilations, Chorley goalkeeper Jack Cudworth failed to spot Harvey lurking behind him and, as he dropped the ball, the Hednesford striker nipped in to slot home into an empty net on 26 minutes. Prior to Cudworth’s howler, the game was an even and relatively quiet affair with the strength and size of Chorley meaning the away side just shaded the opening proceedings. Aaron Rey was lively for The Pitmen however, as his tricky turn bamboozled the right back but his low cross flashed across goal within the first three minutes. 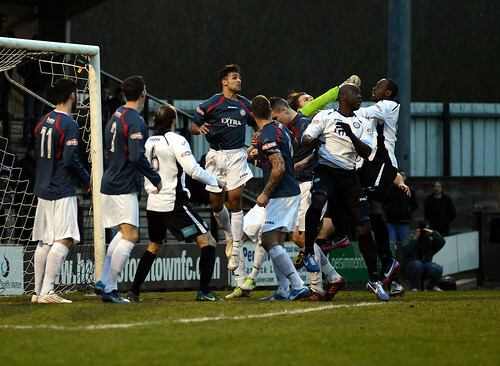 Dan Crane, returning from his one match suspension in goal for Hednesford, was the first goalkeeper to be tested as he saved Darren Stephenson’s shot low to his right on eight minutes. 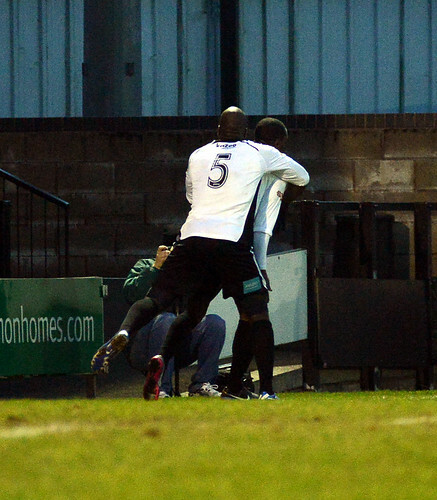 Rey again twisted and turned on the edge of the box and fired a dipping shot inches over the cross bar before the break, but Hednesford proved too strong for their opponents in the second half. The Pitmen had the ball in the net before a two goal salvo which secured the three points as Harvey looked to have sprung the offside trap and finished well past Cudworth, only to see the linesman’s flag deny his second goal on 56 minutes. Ahmadi Porya shot across Crane’s goal but Hednesford put their foot on the gas just after the hour mark when Rey cut in from the left-wing past Mark Ross and rifled the ball beyond Cudworth on 61 minutes and then six minutes later Nathan Woolfe’s free kick was headed powerfully into the net by Harvey to secure the victory. Jamey Osborne could have scored a fourth as Cudworth got a finger tip to a rasping drive from a tight angle before Andy Russell scored a late consolation for Chorley. The late goal was the only blot on Hednesford’s copy book as defence, midfield and attack functioned well to lay to rest the ghost of Rushall from New Year’s Day and keep The Pitmen in the hunt. Rob Smith’s side now travel to Rushall in the Doodson Cup on Tuesday night looking to avenge their recent league defeat and The Pitmen then face Worksop Town in a huge match next Saturday. Worksop thrashed Hednesford 4-0 at Keys Park earlier this season and, with The Pitmen still harbouring a belief that the league championship could be theirs come April, a draw at the very least is vital.